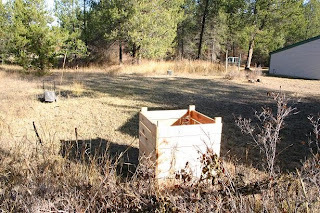 Here are some pictures of the future garden site. We will be starting of with a 50 x 75 foot plot. We have room in the yard to expand at some point, and have plans for a fruit tree orchard, but right now we're just concentrating on veggies and berries. The garden will be just to the right of the greenhouse. It will back up to the trees and be even with the front steps of the greenhouse. You might be able to see in some of these pictures, or guess, that our soil quality is pretty poor. We're planning on using raised beds to overcome this, and bringing in topsoil. Eventually we'll have our own compost to add into the mix as well. 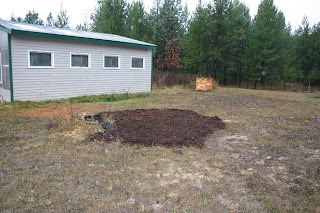 Most of the grass that you can see on the far side of the compost bin will become garden. We'll have to take out a couple trees to start with. I took this picture standing on the western boundary of the garden. The garden will extend to about 5 feet from the driveway and the side of our house. It is about 50 feet from the greenhouse to the trees on the left. Based on some comments from my previous post, and feedback from my all-knowing mother, we decided that the best organic bet for mass weed killing for our future garden would be mulching or "sheet composting," if you will. Today we hit the free mulch get-as-much-as-your-back-can-handle jackpot! This should be no surprise as we live in a logging town, but we feel very fortunate to have found such a wonderful source of mulch. The mulch has some larger pieces, but it has aged for some time (in a town of 2,000 people, how much free mulch can people really consume?) and has broken down a lot. To my largely untrained eyes, it looks like pretty good quality for free! Despite the rain, we got our first load of mulch today. Hmm.. maybe 20 more to go? It looked like so much more in the back of our truck. I'll post completed mulching pictures as soon as we are down. Hopefully the snow will stay away for another week or two while we complete this project. After that - bring on the snow!!! You really have your work cut out for you but it will be worth it all. I have old clay dirt is that what your is? The raised beds idea is a great one. This is so very interesitng when starting a new garden... its like a blank canvas, ready for ideas. Good luck!